When Stuart saw this headline in a Cleveland Scene article (@ClevelandScene) on March 11, 2016, we knew we had to be there! Our first full blog post was about a tour of NASA Glenn Research Center (@NASAglenn) as part of a Cleveland NASA Tweetup in 2012. We were excited to go back for another tour! We attended the NASA Glenn Research Center 75th Anniversary Open House at Lewis Field on May 21 and 22, 2016. (There was also a Technology Day on May 24, and an open house in Sandusky on June 11 and 12 at Plum Brook Station, which we were not able to attend.) There was so much to see that the two days just left us wanting to see and learn more. 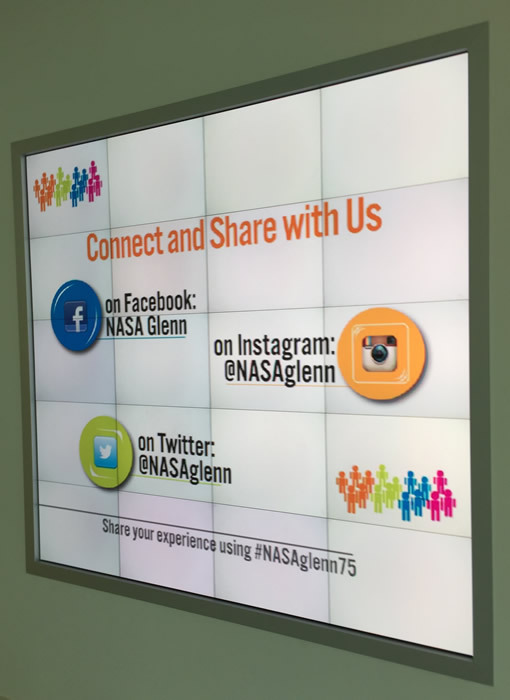 Also, see what people have shared about @NASAglenn 75th anniversary on Twitter with the #NASAGlenn75 hashtag. It seemed like all of Cleveland was there -- huge lines just to get on the buses from the I-X Center (@ixcenter) to the NASA Glenn facility. The following are our photos and tweets/retweets from the two days to show some of what took place at this weekend-long event. We hope that the NASA Glenn Research Center makes this an annual event. Clevelanders have a lot of interest in NASA! By NASA, Editor: Kelly Heidman on April 6, 2016. Last Updated: May 23, 2016. When Stuart was in high school, he had a good friend who was a NASA spaceship expert, who took him to the visitor center that used to be located on the NASA Glenn Research Center (@NASAglenn) property. It was a place that few people knew about, and might have only attracted people who had a strong interest in NASA. Today, people visiting Cleveland can still go to the NASA Glenn Visitor Center, but it is now part of the Great Lakes Science Center (@GLScienceCtr). This location has the advantage of having more exposure to the public. In addition, the Science Center staff members are trained to provide more interaction with the public, and update exhibits more often. While the NASA Glenn Research Center 75th Anniversary Open House at Lewis Field was a once-in-a-lifetime event, the NASA Glenn Visitor Center at the Great Lakes Science Center gives the public year-round access to information. On the first day of the NASA Glenn Research Center Open House, Stuart was pleased to meet Dr. Kirsten Ellenbogen (@kellenbogen) after she spoke at the Great Lakes Science Center's Science Spectacular. She is the President & CEO of Great Lakes Science Center (@GLScienceCtr). Stuart and Dr. Ellenbogen had been in contact online, as we visited Great Lakes Science Center events, and wrote related blog posts. As we wrote above, our first full blog post was about a tweetup at NASA , which is why were so excited to go back for the open house. See the NASA Glenn Research Center Public Open Houses section. Blog Date: Tuesday, December 1, 2015 - CWRU think[box] Thinkapalooza! Read about the partnership with NASA in the CWRU Robotics section. See opening remarks by Dr. Julian Earls, retired Director of NASA John H. Glenn Research Center for the Tech Town Hall. 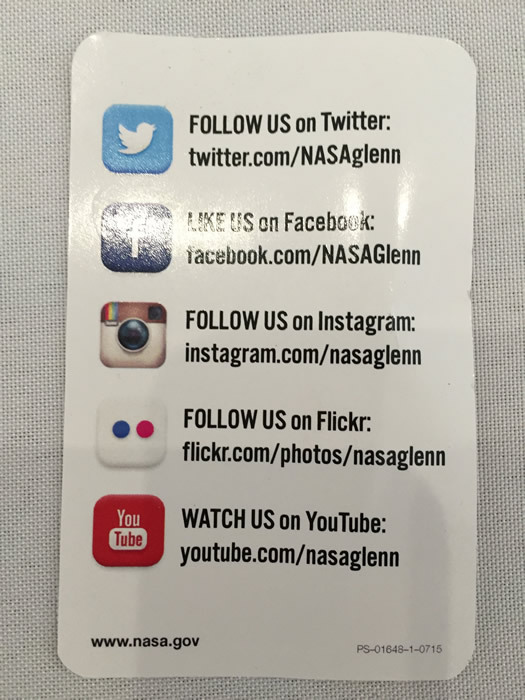 We look forward to attending more NASA Glenn Research Center events. Be sure to follow them on social media to learn more.